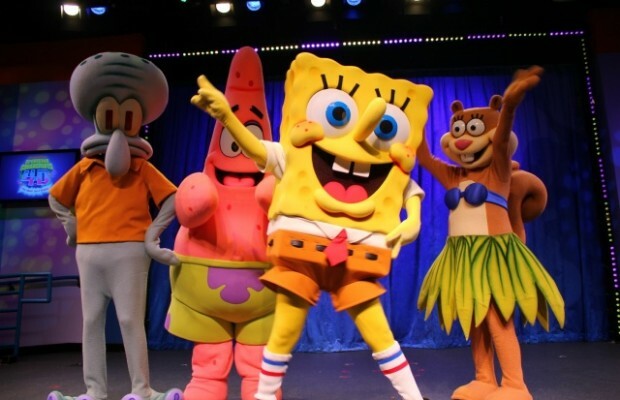 Who lives in a pineapple under the sea and has his eyes set on relocating to Broadway? SpongeBob Squarepants, that’s who. We’re sorry if you thought we were referring to Gary the snail. Spongebob is having a moment, this year the show got its first feature film based on the popular kid’s television show and 2016 will be known as the year of SpongeBob’s musical debut. The Nickelodeon produced show will run as a limited engagement July 7-13 at Chicago’s Oriental Theatre with the intent of making a proper Broadway appearance during the 2016-17 season. If the idea of one of our favorite sea animals starring in his own musical doesn’t motivate you to buy a ticket, the musical lineup might. David Bowie, John Legend, TI, Aerosmith, and Cyndi Lauper have all signed on to produce pieces for the production. It’s like having a Now That’s What I Call Music –Spongebob edition CD that includes all your favorite artists throughout the decades. The best part is that the list of artists signing onto the project keeps getting larger, the most recent additions include Panic! At the Disco, The Flaming Lips and the Plain White T’s. The SpongeBob Musical was co-conceived by Tina Landau (from Steppenwolf Theatre Company), who will also direct. SpongeBob Squarepants is a beloved animated children’s character and his quirkiness defined a generation of young TV viewers. We’ve seen “The Lion King,” “Shrek,” and “Beauty and the Beast” on Broadway, will this be the next hit to have come out of our animated favorites? What other animated characters from your childhood would you want to see on Broadway?